Before diving into this mega roundtable on the Nuggets 2018-19 schedule, click here to see the schedule in its entirety. With all 82 games officially set for the 2018-19 season, the scribes at Mile High Sports got together to give our thoughts on the Denver Nuggets schedule and ultimately gave our win/loss predictions for the upcoming campaign. What do you project to be the toughest stretch in the Nuggets season? T.J. McBride: Basically the entire 25 game stretch after the All-Star break is going to a a gauntlet of death. Denver will play 13 of the 25 games on the road, but 22 of those 25 games are against teams that were the 9th seed or better last year or added LeBron James. Considering that Denver is supposed to begin gaining momentum heading towards the playoffs after the All-Star break, the schedule will do its best to keep that from happening. Denver will have to essentially play 25 games of playoff basketball in order to reach the playoffs for the first time in five years. Dev Johnson: Taking a look at the schedule, the toughest stretch will be March. In March alone, Denver has nine road games and six at home. Not only are they essentially on the road for the month, but they are also playing against teams in their conference that could be fighting for playoff positioning such as San Antonio, Lakers, Golden State, Houston and Oklahoma City in addition to going against Boston and Washington on the road as well. Denver didn’t catch a break in March and will have to battle through that month because it could make or break the season. Brandon Ewing: The Denver Nuggets toughest stretch will undoubtedly come in the final two weeks of the season. The NBA certainly didn’t do the Nuggets any favors in the closing stretch of the year assigning them the task of playing the Detroit Pistons, Houston Rockets, Oklahoma city Thunder, Washington Wizards, Golden State Warriors, San Antonio Spurs, and Portland Trailblazers (twice) as eight of the teams final ten games. Nine of the Nuggets last 14 games are on the road and, not to mention, Denver ends the season with back-to-back games in Utah to face the Jazz and home against the Minnesota Timberwolves to close out the regular season. With the Jazz and Timberwolves being the final matchups of the year, a playoff berth could come down to the final two games for the third straight season. This makes the first five months of Denver’s season that more important with how brutal the teams final stretch is. Each of the last two seasons the Nuggets haven’t started the year off right going 3-7 two years ago and 5-5 last season. Starting the season off right will only help the Nuggets come March and April and it’ll give the franchise a solid stepping stone on what hopes to be a season that ends in a playoff berth. What part of the schedule presents the easiest stretch? T.J. McBride: The easiest stretch of the season is a gift and a curse for the Nuggets because it happens to come at the very beginning of the season when Denver plays 10 of its first 15 in the friendly confines of the Pepsi Center with only seven of those teams making the playoffs last year. If the Nuggets can jump out to a strong start in their first 15 games, it could give the momentum they need to get tons of positive momentum early. Dev Johnson: The easiest stretch appears to be at the end of December and going right into January. Denver will be coming off of a tough home and home set of games against San Antonio in which they play them two days apart in two different cities, but right after that they’re up against Phoenix, welcome in the New York Knicks, travel to Sacramento, then back to the Pepsi Center against Charlotte before going up against a very good Houston team. In that run, they truly have a chance to steal one from San Antonio and start maybe a five game winning streak before going up against Houston. During that eight game stretch, the Nuggets will only face three tough opponents in the Raptors (twice) and Oklahoma City Thunder. Luckily for the Nuggets, only one of those games are on the road and the remaining five games will more than likely be against inferior opponents. If the Nuggets want to gain ground in the standings, this may be the stretch to do it. What’s the Nuggets most important stretch? T.J. McBride: The Nuggets season will be defined by their final 14 games. In that 14-game stretch, Denver is on the road for nine of them and 12 of those 14 teams all made the playoffs the year before. Just to make things even more pressure-filled, the final four games of the season are against Northwest Division opponents who will be jockeying for the playoffs as well. The final 14 games of the season is going to easily be the most intense portion of the year. Dev Johnson: I think starting out the year on the right foot is something that Nuggets’ fans haven’t necessarily seen, so getting off on the right foot is critical to the teams overall success. With teams like the Clippers, Phoenix, Sacramento, New Orleans and Chicago in the first month of basketball, winning all but one of these games will make it easier to avoid being put in the situations from years past being that the Nuggets have missed the playoffs by just a single game in consecutive seasons. Getting off to a great start will give Denver the head start they need. Brandon Ewing: The first three or four months may play the biggest dividends in the Nuggets making it back too the postseason. Like I already mentioned above, the Nuggets started 3-7 two years ago and 5-5 last season, which is something they can’t have this season. With such a back loaded schedule, the Nuggets have to get out to a fast start in order to propel them into a solid first couple months of the season. Sure, the Nuggets face some tough competition to open the season (Golden State Warriors, New Orleans Pelicans, Los Angeles Lakers), but they also face some bottom feeders in the Phoenix Suns, Sacramento Kings, Chicago Bulls, and Cleveland Cavaliers. If the Nuggets are able to take care of business in that stretch and win two or three of their games against tougher opponents, it’ll give the franchise a major level of confidence moving forward. Do you agree with how many nationally televised games the Nuggets were awarded? T.J. McBride: After years and years of Denver doing everything they could to attract a national audience to see their Nuggets squad, 2018-19 is finally here. Denver will have 14 nationally televised games — good for 9th best in the NBA and 4th most in the Western Conference — with five of those games going to be on TNT and the other nine match-ups on ESPN. Denver’s nationally televised schedule is spread out between nine different teams with the Nuggets playing the Lakers, Trail Blazers, Thunder, Warriors, and Timberwolves twice on a national stage. Denver has finally gotten the recognition they feel they deserve, and now they just have to come out and put on a show. Dev Johnson: Denver is expected to have a very interesting team and they have the talent to make the playoffs. With that, they are a team that fans will want to see. Having 14 nationally televised games is the type of exposure that the organization wants and getting that national attention is where the team should be. Seeing 14 nationally televised games is interesting being that Denver has not made the playoffs in five years, so having so many games on national TV shows the kind of expectations placed on the Nuggets on a national scale. This is a year that Denver fully expects to make the playoffs and with 14 nationally televised games, viewers will be able to watch the team more as they fight for the playoffs. Brandon Ewing: Up from five games a season ago, the Nuggets will be featured 14 times on national TV next season, nine on ESPN and five on TNT. With that number doubling from just two seasons ago, it says a lot in regards to how much the Nuggets have grown as an organization. After struggling to get nationally televised games just a couple seasons ago, the Nuggets will now be featured prominently and will have a major opportunity to showcase their exciting young core to the rest of the NBA world. T.J. McBride: As always, this win/loss prediction is predicated on the Nuggets being significantly healthier this season, more internal improvement, and a (hopefully) fully season of Paul Millsap, but it is hard to see the Nuggets not winning in the high 40’s or low 50’s. With that being said, I have them finishing the 2018-19 season with a record of 50-32 and being the fifth seed in the Western Conference. Dev Johnson: The final wins/losses is dependent on health as seen in year’s past. With the team being healthy, this is a team that’ll surely make the playoffs and contend for a higher seed in the playoffs. If unhealthy, their ceiling drops tremendously. I’ll go out on a limb and say that I do expect this team to make the playoffs, but only win 48 games and end up as the 7th seed. Brandon Ewing: The recipe for the Denver Nuggets 2018-19 season is to start fast, dominate till March, and survive the final two months of the season. If the Nuggets can do that, I believe they’ll be well on their way to making it back to the postseason for the first time in five years. If guys like Murray, Harris, and Jokic continue to take that next step, they’ll be the catalysts for Denver’s playoff push. 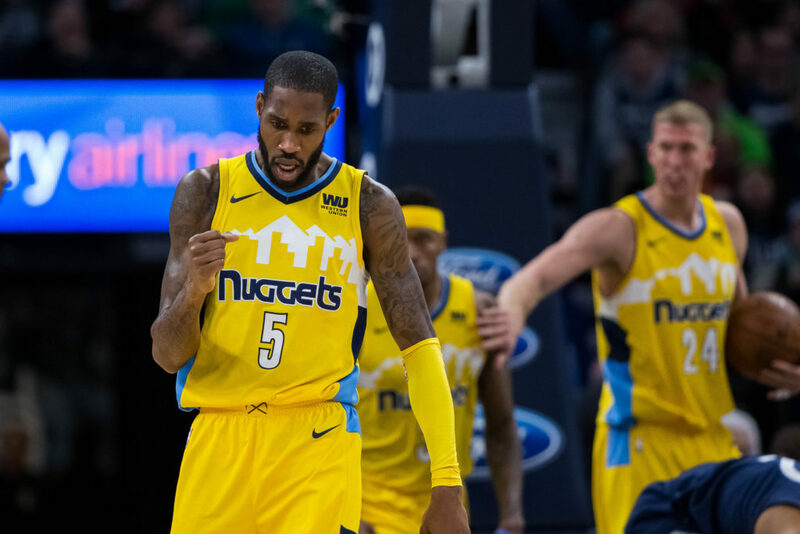 Sprinkled in with a spark of Will Barton, Paul Millsap, and Isaiah Thomas, the Nuggets will definitely make some noise come late April. 50-32 and the 4th seed in the Western Conference.